Documentary: Exercise: "Around and Afterthoughts"
The aim of this exercise is to read Martha Rosler's article "around and Afterthoughts (1992) published in "The Contest of Meaning" Richard Bolton (ed.) and to make notes here in the learning blog. I found this quite an interesting read, in general it questions the genre of photographic documentary in society. It discusses the work of some of the great photographers that took images from their own perspective, yet Rosler suggests that this perspective is sometimes re-interpreted commercially in the art galleries and museums of an elite. Rosler argues this point a couple of times suggesting that this is to keep the status quo yielding towards liberalism. Rosler quoted Jacob Riis [1849-1914] over a comment made when he heard of the invention of the flashlight "The darkest corner might be photographed that way". A brilliant play on words suggesting that documentary can also been seen as the darkest corner of photography. The article describes many practitioners and forms a commonality of documentary aiding social reform by bringing these darkest corners to light. 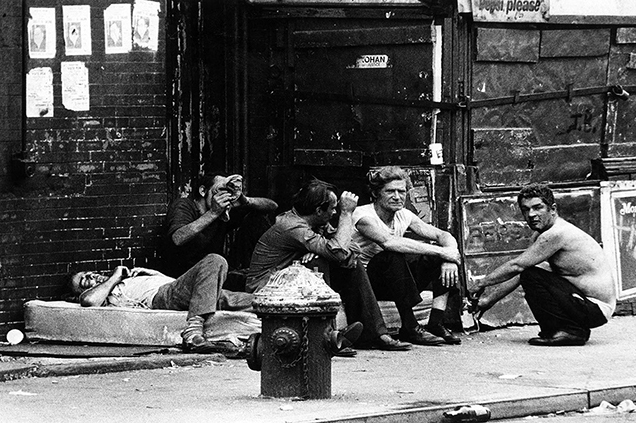 A common theme being the Bowery district of New York City, where 'bums' lived between the street and the shop fronts in a constant state of drunkenness. Although not mentioned in this article, through it, I have discovered Leland Bobbé [b. 1948], an American Photographer renowned for his work covering fringe elements of society. Being brought up near The Bowery he captured images in the 1970's that really are quite disturbing by today's standards. Rosler makes a comment that in some cases the images are more unsettling than "the argument enveloping them". By this I read that as still images the viewer is left wondering, in a state of flux and is more unsettled than the actual event. This is repeated in the article where the viewer may ask the question of what happened to subjects in the image. For example Dorothea Lange's migrant mother, (Florence Thompson), the twins of Diane Arbus, all of which have been re-photographed later in life. Personally the most disturbing and brutal image of documentary is that of Robert Haeberie "People about to be shot" . In this image we know what happened to the subjects but nonetheless I still have a small piece of my mind that lives in hope of their survival. Is this a evidence that we may not always accept or want to accept extreme forms of documentary? Rosler makes a really great point that this disturbing nature of documentary can lead to sensationalism or 'trophy hunting'. Furthermore she addresses concerns that commercial organisations have promoted such work in order to make capital gains, such as the work of Edward S. Curtis that was bound in gold-decorated volumes and sold for enormous amounts of money. Martha Rosler makes an important point that documentary has two moments  the immediate and  the aesthetic-historical. This is very true and I was hoping that she may address this further as I have often wondered at what point does an image move from  to , what are the triggers and how fast is the transformation? I suspect that this is largely down to the individual image or set of images. For example the images of 911 would have traversed into the aesthetic-historical faster than most, is this because that is where we want this event to live?